Do you wonder how should You wire your home? Home Pre-wiring can provide a flexible and cost effective way to cater for present and future technologies during the construction stages. 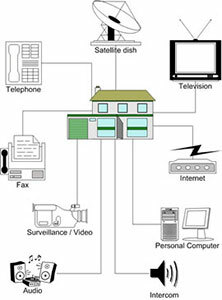 Devices include networking, phones, security, audio visual digital TV, home theater, computers, and automation equipment. With the installation of cabling at a later date, it is not only difficult but expensive. We will pre-wire your home for the future to accommodate You greater entertainment experience. We offer all types of pre-wiring for new homes or renovations.